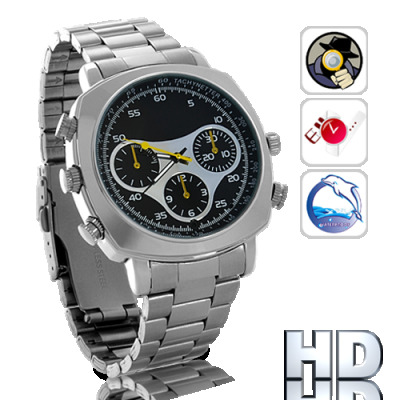 Successfully Added Waterproof HD Camera Watch with AV Out (8GB) to your Shopping Cart. Waterproof HD Camera Watch with AV Out (8GB) - the ultimate undercover and underwater gadget is here and features high definition video recording, high resolution photo captures, and a durable all-metal waterproof design. Water and electronics normally don't mix, which is why your unsuspecting victims have no idea your wrist watch is actually a hi-tech waterproof device! With an IPX8 rating (completely waterproof and submersible up to 3 meters), it's not an exaggeration when we say you can take this HD camera watch with you wherever you go... For the agents out there, that means you can finally swim your way out of a volatile situation! As for the rest of us... another reason to look forward to that trip to the beach or spa. This Waterproof HD Watch features one button recording and comes with 8GB internal flash memory for plenty of 720P high definition AVI format video footage. To view your recordings, simply connect the watch to your PC or laptop with the USB included then drag the files from the watch to your desktop. Not convenient enough? Then just connect it to your TV (or other AV-compatible monitor) with the AV cable for instant video playback! 720P HD video recording, an undetectable lens, and an ultra-durable waterproof design, this watch is a must-have addition to anybody's arsenal of gadgets - which makes it invaluable for your online store! Available in single piece or bulk orders, purchase a few today and start making some profit with yet another high quality device from Chinavasion. When using underwater make sure to use the included screw-on microphone cap to avoid damage. Does this watch also record audio? Yes. To record clear audio, the closer you are to the subject the better. Works great for interviews and records best within a range of 3 meters. However, when used underwater or with the underwater microphone cap, this device will not record audio. Could you arrange sending this whatch (one position) to Ukraine and how could I get it in Ukraine? This model is a re-design (asthetically) of earlier models, of which i have one. The 8Gb might be bigger , i forget. My VERY similar device does the job: it totally passes for a normal wristwatch, and the lens really is nearly impossible to see. The only problem is this: for waterproofing, one must change the 'screwcap' that hides the mic port (bottom right button) must be removed and another one put in its place .. The replacing cap has no 'hole' , and has a good miniscule 'O' ring seal. Now, in theory this is fine except for the fact that these caps are so EASY to lose! they are 1/3rd the size of a pencil eraser. Tiny! so if youre not very and meticulously careful, those caps are gonna disappear, as two of them did for me! But the price and the performance are extremely good.